One-pot meals are the savior of weeknight cooking, and this pasta is one of my go-tos. 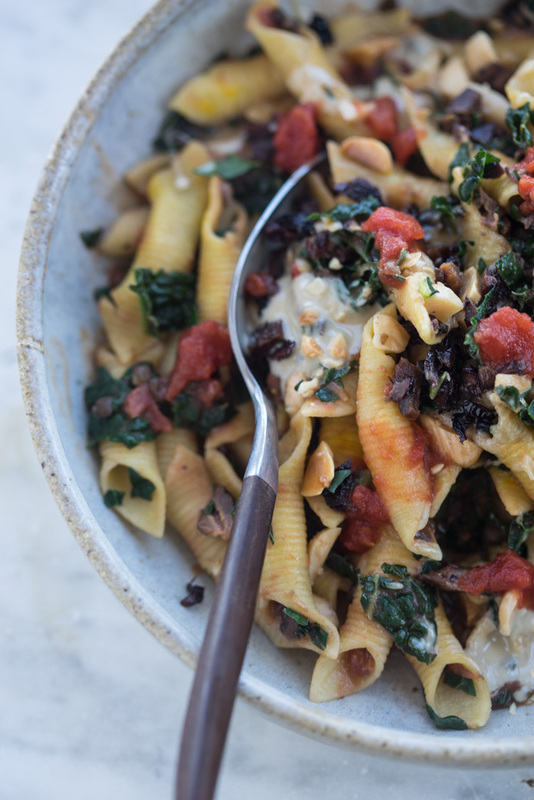 It’s pasta and lentils simmered in crushed tomatoes, finished with lots of chopped kale, saffron, swirls of tahini and chopped almonds. I made a video of how it comes together, but the gist is to simply place most of the ingredients into a big pan or skillet with boiling water, simmer down until the pasta is tender, and plate in shallow bowls with your favorite toppings (I include a list of suggestions). Variations couldn’t be easier once you get the hang of the technique. The recipe is included here, and you can also see how I pull it together in the video. As I mention in it, you can easily do a vegan version of this, or use whatever gluten-free pasta you like. I think the reason I always come back to this recipe is because you’ve got greens, protein from the lentils, and a range of whole healthful ingredients all in one pan. It’s a total crowd-pleaser, and leftovers are A+ as well. French lentils or black beluga lentils are both great choices here because they retain their shape. Place the pasta, tomatoes, olive oil, lemon zest, garlic, and salt into a large, deep skillet or saucepan. Pour 4 cups of boiling water over the tomato mixture, cover, and bring to a boil. Uncover, and simmer until the pasta is just al dente, depending on the pasta this typically takes 6-10 minutes, stirring regularly. Once the pasta is al dente, stir in the lentils, and then the kale, allowing it to collapse. Finish with the saffron. Allow the pasta to finish cooking, and much of the liquid to be absorbed, another minute or so. Serve topped with any toppings you like in a shallow bowl – dollops of tahini, chopped almonds and olives are pictured here. Seriously, I’m not entirely sure what possessed me to share this very last minute, made-up-on-the-spot-recipe, if not simply because I’d rather not forget it exists. As far as I am aware there are no rules for simplicity of recipes on blogs, so it seems I’m safe. I have said this before and I’ll say it again. Curried eggs are OVERRATED! As a child, the curried egg sandwiches (complete with fluffy white supermarket bread and butter) were THE business. Moist, squeezing out the sides deliciousness. Strangely though they disappeared from my diet, along with Friday night fried dimmies (the treat when mum and dad went out), Kraft cheddar (heaven forbid) and what’s that processed meat roll called? The one we had with home made tomato sauce? I forget. Irrespective, curried eggs died an unjustified death with the rest of the processed rubbish that I (only occasionally) ate, as a treat. Shame. Anyway, what was a very quick and easy lunch (above) was a total delight and I think it needs replicating (sans store bought mayo and any other nasties in sight). Mash up all the ingredients together and dollop onto your cracker, sandwich…whatever tickles your fancy. Enjoy. It’s just after 9pm and my mind has no sooner switched off from thinking about a dinner creation and it’s moved straight onto breakfast. This is what happens when you’re a bit food ‘mad’ (I’ve said this before and I’ll say it again…I’m no rabbit in the meals department). I have spent many years of a corporate career trying to find an outlet that satiates my creativity and I guess I’ve found it. The purpose of those couple of sentences is to show you what often happens in my kitchen after dinner. Breakfast happens. And attached is yesterday’s breakfast which was lovingly prepared in about two minutes. People, this is FAIL proof, seriously. As long as you don’t add salt instead of stevia or pepper instead of chia seeds. You get my drift. In any case if you haven’t yet discovered chia seeds, please give these little seeds of joy a go. They are so very good of you – they have the highest known plant source of Omega-3 – sold?! But the best thing is that they are super versatile. Add liquid to chia and it turns into jelly, thickens up in the space of 10 minutes. For a “need-a-spoon-consistency” smoothie lover like myself, chia is a dream come true. Throw it all in the glass and stir. Cover and pop in the fridge for breakfast. Voila! A word of warning, don’t leave your chia seeds sitting in the liquid at the bottom of the glass even for a minute. They’ll solidify and you’ll have a battle mixing in all the other ingredients. Also, never fear if you don’t have all of these ingredients. You could throw chia, milk, a sweetener and berries and you’ll have a beautiful thick parfait. You could also add nut butters, chopped nuts, coconut oil (oh lord that’s good – it solidifies in little bits and adds great texture). Go for your life with it. Also, you can do this 15-30 minutes before breakfast. I’m just a bit food mad and can’t wait that long.